Harold was born in Bury, Lancashire in 1852 to Charles and Mary Partington and was baptised at St Luke’s Church, Heywood, Bury. He developed a taste for drawing on the family farm and eventually, encouraged to turn his hobby of drawing and painting into a profession, opened an art shop in Queen Street, Bury, the first in the town. Following its success Harold moved to more spacious premises in Market Place. There he added the business of photographer. He was a member of the Rochdale Art Society and joined the Bury Art Society when he was 24. A lover of nature, he spent much of his time in the Ashworth Valley, a well-known beauty spot. The 1881 census showed him living with his wife, Sarah, and described as a “painter artist”. They had two children, Cuthbert (1882-1939) and Beatrice (1884-1966). In 1891 Harold was described as “artist and photographer”, although he was also a carver and gilder. the business in later years when Harold retired. Sarah died suddenly on the Isle of Man and this was reported in the Manchester Courier and Lancashire General Advertiser on 20 June 1903. The article described Harold as a “well known Heywood artist”. In 1905 Harold married Asenath Wolstenhome (1862-1934), the daughter of a cotton spinner and waste dealer. They moved to The Brambles, Ball’s Road, St Annes on Sea, which later became part of Highbury Road. Cuthbert also moved to St Annes and lived at 27 St Andrew’s Road North from where he ran a business as a Fine Arts Dealer. Some of the paintings in the Lytham St Annes Art Collection bear his label. His sister, Beatrice, married the artist and gilder, Bernard Dean Walmsley (1893-1985) in 1922. Harold was a frequent exhibitor. The Banqueting Room, Haddon Hall was shown in the Autumn Exhibition at the Manchester City Gallery in 1890 and a painting entitled The Open Door was exhibited at the Royal Cambrian Academy of Art in its 37th Annual Exhibition in 1919. 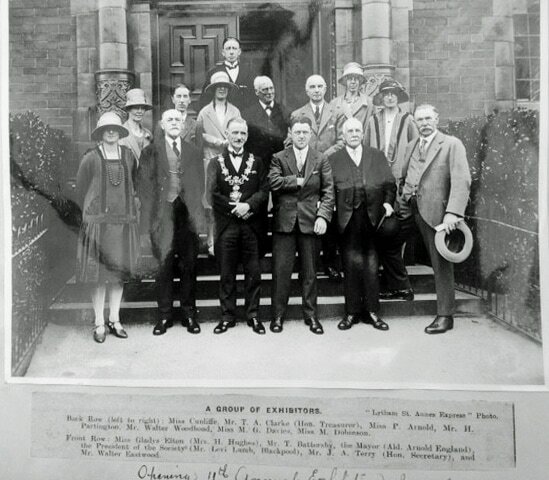 John and Cuthbert Grundy (afterwards Sir Cuthbert Grundy), Lady Hopwood, Sir William Cunliffe Brooks and Messrs Bright of Rochdale. In doing this Sir Cuthbert was honouring the town of the artist’s birth. Harold’s work found a ready sale and was often purchased prior to completion. He committed many scenes of the changing Fylde to canvas, including those of the fast disappearing sandhills, all now recorded for perpetuity. He was an active member of the Fylde community and was connected with the Church Road Wesleyan Church in St Annes and later the Congregational Church. He was Vice President of St Annes Cricket Club and could often be seen watching a match on a Saturday afternoon. After retirement he took up woodcarving as a hobby and such was the quality of his design and craftsmanship he was commissioned to carve many pulpits around the county. The Ansdell Institute’s War Memorial, designed by Mr A Taylor, was carved in oak by Harold and lettered by Mr T A Clarke. Presented by the Lytham St Annes Art Society it was first viewed at its 8th Annual Exhibition in 1924, which was held in the Institute. Harold Partington died on 6 April 1928. An article dated 20 April 1928 appeared in the Lytham St Annes Express, entitled 'An Appreciation of Mr H. Partington'. Written by Walter Eastwood, a founder and distinguished member of Lytham St Annes Art Society he alluded to the fact that “Mr Partington and I have for nigh on twenty years spent a month together in the autumn among the Fells in Lakeland………………………”. Kathleen Eyres, the local historian, used his watercolour Tied Farm Cottages, Twiggy Lane, St Annes as an illustration in her book, 'Fylde Folk' (1970).